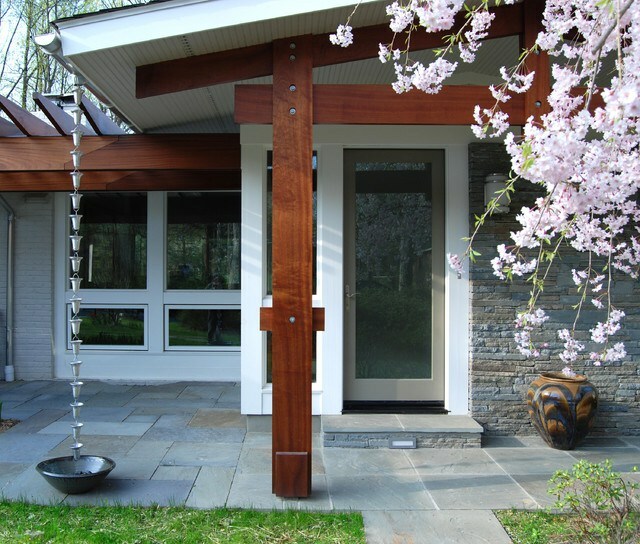 Rain chains are a functional piece that complements the rain gutter system, providing a touch of beauty and style to the outside of your property. 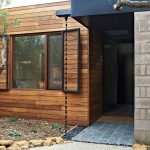 Their main function is to lead rainwater from the roof to the ground in a harmonious way without affecting your home’s curb appeal. 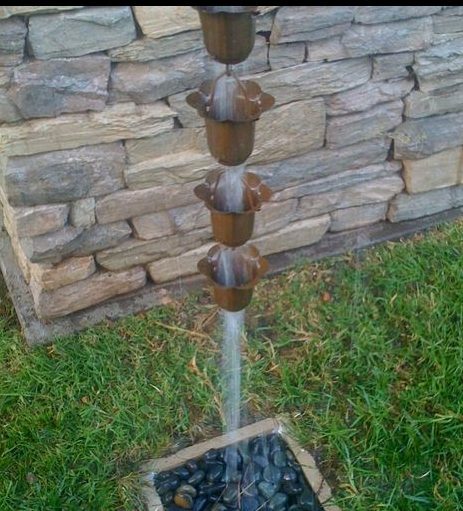 There is a wide variety of styles and finishes of rain chains available for you, from the simplest to the trendiest one. 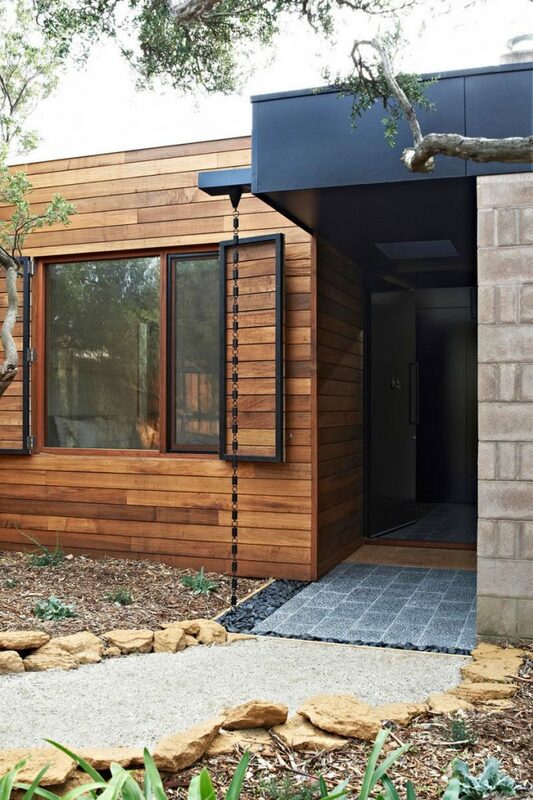 An important thing to take in consideration when installing custom rain gutters that include rain chains is where to place them, since this is the key to have a drainage system successfully working. 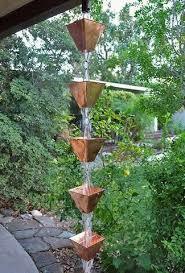 Rain chains origins come from the Japanese culture, they called them “kusari doi” which means “chain gutter”. However, they didn’t have the same function then as today. 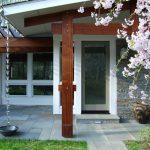 For years Japanese used their house’ roof to collect rainwater using linked chains hanging from the roof to the ground, and at the end of it, they used to put a large container to collect water for household usage. 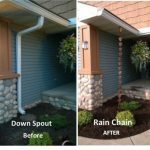 Over the last decade, rain chains have changed their purpose and they are becoming popular around the world as a decorative downspout, replacing the regular ones. 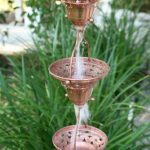 On the other hand, cup chains are more popular for the elegant touch that they add to your home, thanks to their sophisticated finish which can be copper or aluminum and diverse and beautiful shapes, such as small cups, square cups, flowers or bells. 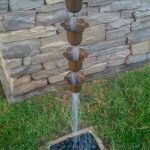 They are preferred by customers for being better at controlling the flow of water producing fewer spills, which represents a great improvement in efficiency over link chains. 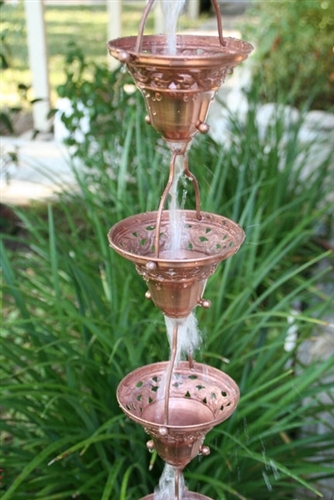 Cup chains consist of links and little cups with open bottoms that permit water to travel downward without problems. 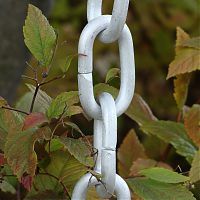 They can resist higher volumes of water than link chains, which makes it more resistant in places with frequent rainfall. 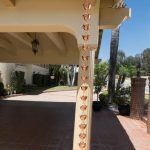 The most visible advantage of rain chains is that they are more appealing than traditional downspout, since they come in different designs and finishes, including copper and aluminum, which makes your house to look very sophisticated. 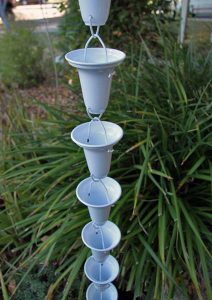 Some of the models make relaxing sounds like wind chimes, while the water goes through the cup chain, making them a great option for your yard. 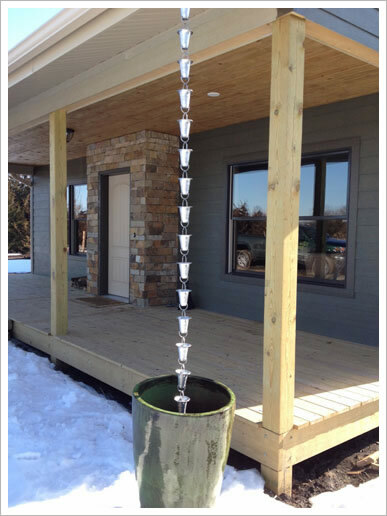 Rain chains are eco-friendly. 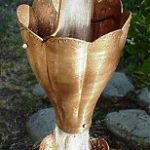 They can be paired with vases and containers to collect rainwater that can be used to water the plants of your garden, this way you contribute with the planet, without wasting this valuable resource and you will keep applying their original function. 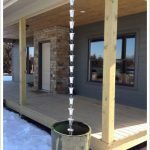 To guarantee the effective use of rain chains you need to consider the climate of your area, especially if you live in a rainy place. 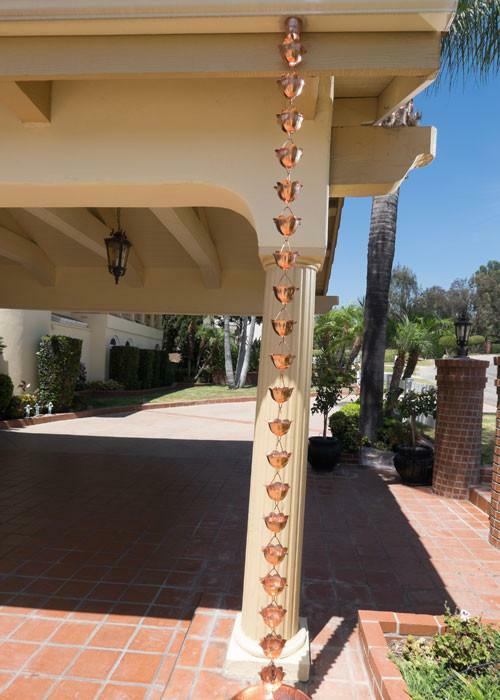 Rain chains can work without a problem unless the volume of rainwater coming from your gutters is too high, which is very common during rainy seasons. 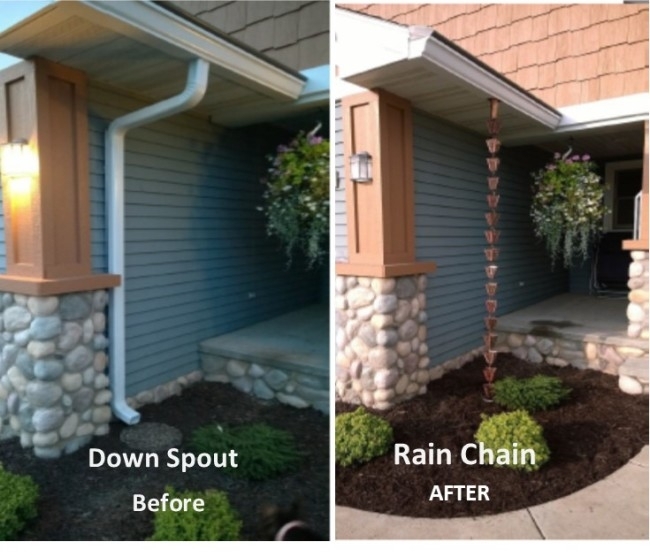 To resist a heavy downpour with rain chains, you can either install many rain chains or combine them with traditional downspouts. 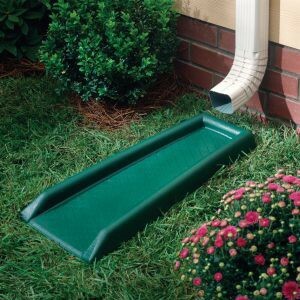 Both options will help your drainage system to distribute the rainwater. 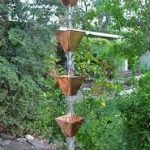 It is also important to have an effective collection system, which could be a water feature like a barrel, a temporary water garden or a French drain that directs the water to another place away from the house to prevent damages. 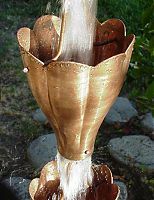 Another natural element you need to consider when choosing rain chains is the wind. 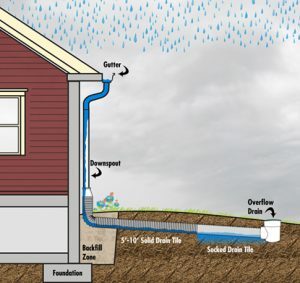 If you live in a high wind area your house will need an overhang of at least three feet to permit rain chains to effectively work, as well as a proper drainage system below them. Also, consider anchoring the chain to keep it in place if you are concerned about high winds. 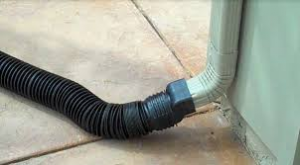 Whether you choose link or cup chains, our recommendation for you is to pick the best option regarding functionality and efficiency, in order to have a harmonious flow of the rainwater in your drainage system, that does not affect the beauty of your front yard or porch.